I've teased about Steam, speculated about Steam and even bragged about Steam finally coming to Linux. Heck, check out the screenshot for just a partial list of games already running natively under our beloved OS. Little did I know that the folks at Valve not only planned to support Linux, but they're also putting a big part of their future behind it as well! Valve recently announced SteamOS, which is a Linux-based operating system designed from the ground up to play games. 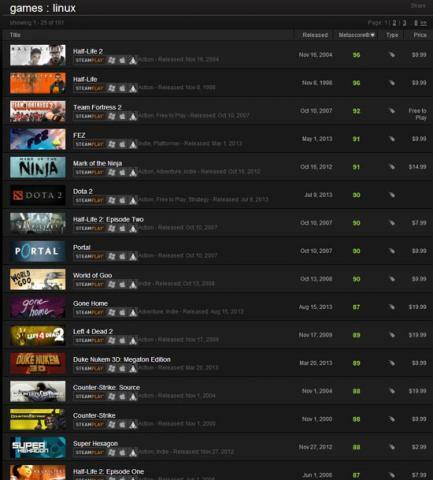 Steam games. The operating system will be free, and it also will be the OS running on Valve's next big thing, SteamMachines. Although the hardware won't be available until sometime in 2014, the OS should be out before then. Will Valve be the company to bridge the gap between computer gaming and console gaming? Will PC games translate to a television screen smoothly? Will the SteamOS's "game streaming" technology effectively bring the entire Steam library to Linux? I've learned enough not to make any predictions, but I can tell you it's an exciting prospect, and it's even more exciting because it's all running on Linux!